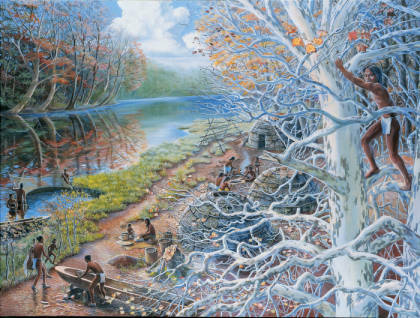 Painting from the Ancient Ohio art series depicting an Archaic base camp along the Maumee River in northwest Ohio. 1 8000 B.C. to 500 B.C. 8000 B.C. to 500 B.C. Archaic hunters and gatherers continued the successful way of life of their Paleoindian ancestors, but moved about in a smaller area. They found new ways to harvest the rich natural bounty of Ohio's forests. The Archaic Period began at the end of the Ice Age. The climate had warmed and thick forests grew across Ohio. "Archaic people" is an archaeological convenience term used to refer to the technology and cultures of various people living at this time, as archaeologists have speculated based on the material record. Like the Paleoindians before them, Archaic people hunted large and small game animals, fished in the lakes and streams, and gathered nuts and berries. During the early part of the Archaic Period people were always on the move. Their shelters were tents made from wooden poles covered with bark or hides. Later in this period some groups began to settle down and focus on certain rich resources such as nuts or shellfish. They built sturdier houses and dug pits alongside for storing nuts and other foods. One of the Archaic people's more important natural resources was flint. They mined flint from several sources, but in Ohio, their favorite flints continued to be Upper Mercer flint from Coshocton County and Flint Ridge flint from Licking County. Tools made from flint supplied many of their needs, but new kinds of tools were added to the Archaic toolbox. Archaic people made sturdy axes from hard stone such as granite. They used these axes to chop down trees and shape the wood into dugout canoes and other useful forms. They also carved and polished pieces of a rock called slate making them into a variety of shapes. Many of these artistic carvings were used as weights or decorations for their spear-throwers. A spear-thrower, or atlatl, is a wooden shaft with a handle at one end and a hook at the other. The spear-thrower was used to catapult spears much farther and with more force than if they were thrown with the unaided arm. Hunting and gathering bands usually don't have chiefs. The leaders in the group are men and women who have earned the respect of the group because of their abilities at hunting, healing, or providing some other needed goods or services. Men and women were free to leave the band at any time to join another, or to fend for themselves. Late Archaic groups such as the Glacial Kame people also began to trade with distant groups for copper and sea shells. These special ornaments may have belonged to leaders or respected hunters or healers. When these people died, the objects were buried with them as symbols of their high status.